Portable traffic light KOMKON SDM is designed for traffic control during performing of maintanance and construction operations on the roadway. Application of the portable traffic light significantly increases safety on the operational site, decreases probability of traffic jam appearance and proides more comfort to service personnel. KOMKON SDM consist of two portable semi-kits (master and slave) connected via radiochannel. Communication range depends on operational conditions. In rural or panted environments the range could be around 1-1,5 km, in direct vision condition the range can reach up to 4-5 kilometers. Operation via radio channel makes possible rapid deployment on the road. Mobile semi-kit SDM consist of detachable metall stand on the X-cross basement and a signal head. Signal head is made in solid plastic housing, containing two LED matrixes, red and green, and also three-digit board for time countdown (1..999 sec). Signal head on the master semi-kit is additionally equiped with control unit – SDM controller. Control boards, radiomodems and antennas are installed inside signal heads. SDM also includes wires for connection to the power source (battery). Power source is not included. 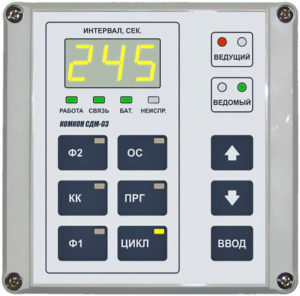 Traffic controller that performs control program is made according to DSTU 4157-2003. * In case of direct visibility. ** No need of special permissions.